Dozens of colleges and universities have pledged to give applicants with criminal records a better shot at getting a higher education. The Obama administration announced earlier this week that 61 colleges and universities, including the University of Maryland, Arizona State University and New York University, have signed onto its Fair Chance for Higher Education pledge. These schools join 25 other colleges that signed on earlier in the summer. The colleges have committed to a number of measures, including adopting admissions practices that don't rule out candidates early on in the decision making process because of their criminal records and making internships and job training available. "When people make mistakes, we have to focus on how we give them a meaningful second chance," said U.S. Secretary of Education John King. "Think of a student who, as a teenager, may have been convicted of a minor nonviolent drug offense. Now, 20 years later, it doesn't make sense to prevent this student from getting their education." In August, NYU said its admissions staff will start ignoring whether an applicant has checked the box stating whether they have ever been convicted of a crime. Instead, the university said it will first assess whether the applicant is fit for admission based on other criteria, then ask "narrower" questions that will help the admissions counselors to differentiate between violent and non-violent offenders. "This new approach will separate the issues of an applicant's academic qualifications from his or her history of criminal conviction... while still enabling the University to make thoughtful decisions about ensuring the safety of its community," said MJ Knoll-Finn, NYU's vice president for enrollment management. 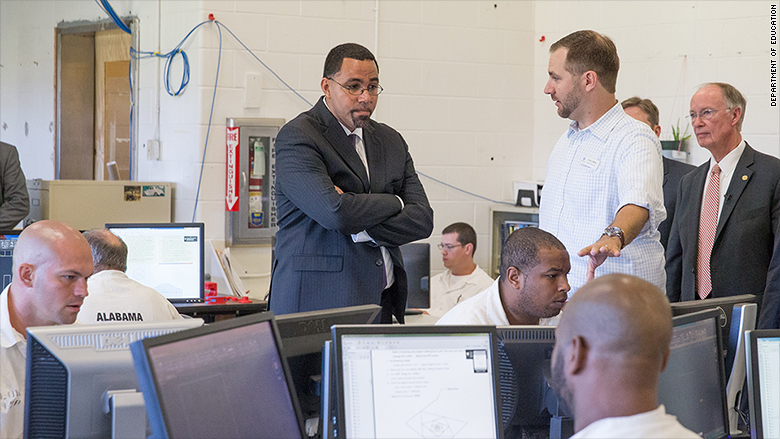 U.S. Education Secretary John King (left) on Wednesday at a computer lab at Alabama's Limestone Correctional Facility, where inmates participate in the Second Chance Pell grant program. The White House said Wednesday that an estimated 70 million or more Americans have a criminal record. That's almost one in five Americans. "We are better off as a country if we help those who have gotten off track get back on a pathway to success by giving them a fair chance to successfully reintegrate and lead productive lives in our society," said King. In July, the Department of Education launched its Second Chance Pell pilot program. Through it, $30 million in grants will be made available to nearly 12,000 incarcerated students for post-secondary education and training programs. 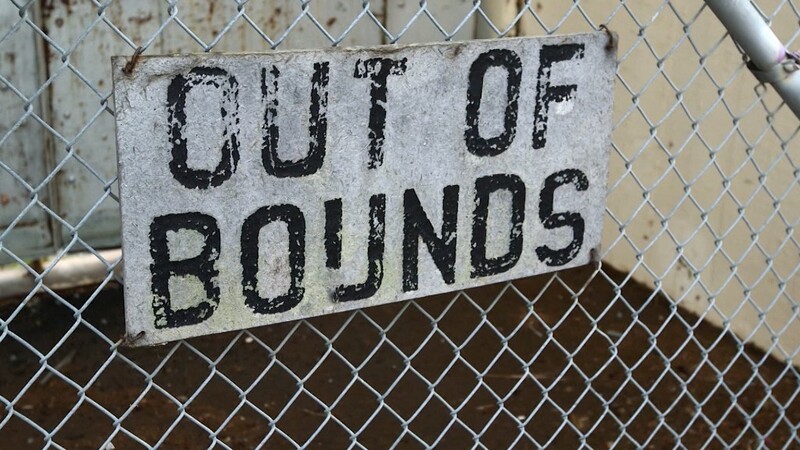 A 2013 study from the RAND Corp. found that incarcerated people who enrolled in classes and other educational programs while they're in prison are 43% less likely to return to prison within three years than prisoners who don't enroll. Inmates of the Limestone Correctional Facility learn horticulture as part of the Second Chance Pell grant program. Almost 20 years ago, Daryl Atkinson plead guilty to a first-time, nonviolent, drug crime and served 40 months in prison. After serving his time, Atkinson earned his associate's degree at a local community college. But when he applied to a four-year college, he was rejected. "The only reason that I can fathom was because of my criminal record," he said. Atkinson then applied to Benedict College in Columbia, South Carolina and got in. He has since earned a bachelor's in political science and a law degree from the University of St. Thomas School of Law in Minneapolis. Now, he's a founding member of the North Carolina Second Chance Alliance, which helps former inmates reintegrate into society. He is also a Department of Justice Fellow. Broderick Johnson, a member of President Obama's Cabinet and the Chairman of the My Brother's Keeper Task Force, said programs like the Second Chance Pell not only give people with a criminal record a second chance, they also help the economy because they help the formerly incarcerated become productive, working members of the community. In a separate initiative, the White House is also turning to the business community to make sure there will be jobs available to them. So far, over 100 organizations, including American Airlines, Coca-Cola, Facebook and Google, have pledged to eliminate barriers that would typically prevent someone with a criminal record from getting hired. One such change will be to delay asking about their criminal history until later on in the hiring process. "I think we really have to shift, as a country, how we view folks who are involved in the criminal justice system," King said. "We have to ensure when they leave prison that they can contribute to their communities."